From the transport museum to being a manufacturing powerhouse, Coventry has always been an industrial engine for England. Being the second largest city in the West Midlands with two fantastic universities in Coventry University and the University of Warwick. It also has transport links giving easy access to Birmingham and London. It's no wonder we are getting more and more requests for computer training in Coventry. 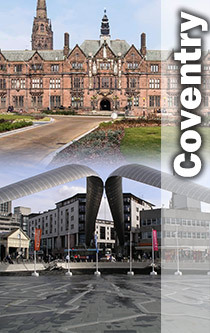 We at Computer Tutoring are pleased to offer training courses in Coventry. Seeing as we already offer courses in other West Midland cities it was obvious that we should be bringing our skills and experience to help businesses in Coventry and the surrounding areas. Please feel free to contact us if you have any questions about how the training is conducted? Please use our enquiry form or give just us a call: 0800 158 3588.